The Internet2 research network announced the completion of a major upgrade to its national infrastructure. It now operates at 100 Gbps capacity for U.S. research and education communities. Internet2 is the infrastructure that forms the backbone for an advanced IP network that supports IPv6, multicast, and other high-performance network technologies. 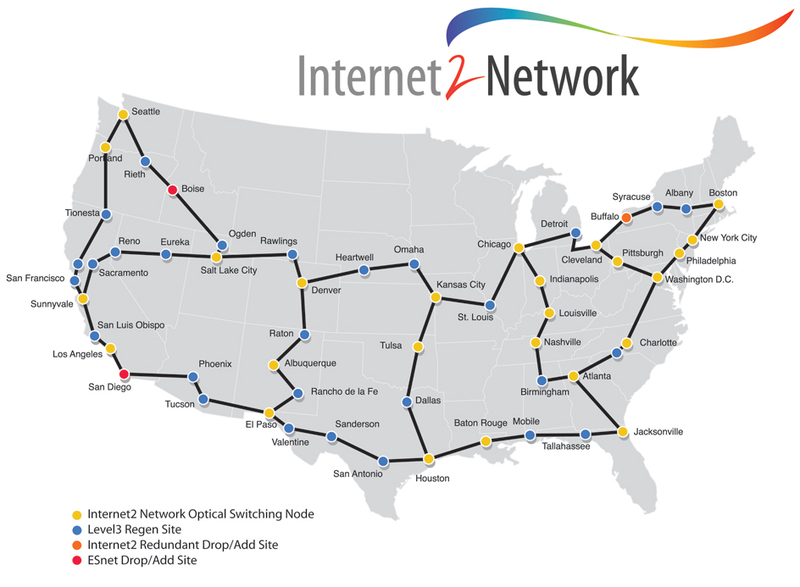 At the Internet2's annual Fall Member Meeting in San Diego, the company also showed off its new Dynamic Circuit Network (DCN). This network will let U.S. researchers provision up to 10 Gbps of dedicated bandwidth on demand between two points in the network. This service will be live in January of 2008. The main network remains IP-based and connects more than 200 universities, in addition to limited connections to government and industry facilities. Each network segment now features a set of 10 10 Gbps links, each running on a separate wavelength of light, for a total of 100 Gbps of bandwidth... Internet2 says it can scale each segment to handle up to 100 wavelengths in the future. The Internet2 team is reportedly working with Level 3, Ciena, and Juniper to develop 40 and 100 Gbps technologies to further boast the speed of each link. Do you suddenly wish that you were back in school? What would you do if you had 100 Gbps broadband access?